I have been wanting to write a post for about a month now, but this amazing late summer/early fall we've been having in the Hudson Valley has me busy with other things. I'm not complaining! But today, as I soak in the hot sun--it's hitting 80 today--I realize we are very close to the end. I am almost done with closing the garden up, the fig trees have been replanted in their winter pots, and stink bugs are crawling everywhere. It's inevitable that every time we have a last burst of heat, some bug frenzy happens. Last year it was lady bugs, this year, stink bugs. I can feel it everywhere as I walk around my yard. The maples are turning yellow, the purple asters are lining the hill, the goldenrod surrounds the pond, and the bees are busily making haste. I have heard from various places that this year is going to be a snowy and cold winter. Have you noticed all the woolly bear caterpillars out this year? I am seeing them everywhere: fat black ones, little fuzzy black and brown ones, and one huge white one. I haven't seen so many in years. There is a small cool breeze that underlies the heat of the sun today. It riffles the leaves, and they slowly fall, lazily coating the ground. The neighbor's rooster crows, and the buzz of the bugs seems muffled. Birds call, and dogs whine, chainsaws buzz and trucks lumber by. It's lazy but focused, it seems. The word portentous comes to mind. Everything seems to remind me that quite soon I won't be sitting on the porch sipping a beet-carrot-apple-ginger juice in a t-shirt and shorts. Even the preserving has slowed down a bit, although this batch of plum conserve is on the stove top as I write. Made with some gleaned tiny blue prune plums, I was looking to make something that was rich and cozy for the coming winter. I asked folks on my Facebook page what I should make, and there were a few good ideas! 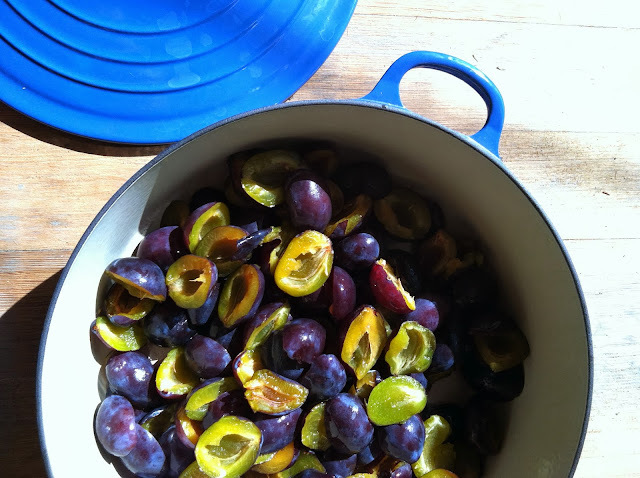 I have saved some plums to make the kuchen that Rosemary posted. I adapted this from a recipe for Nutty Plum Conserve from the Ball Complete Book of Home Preserving. I removed a bit of sugar (and must admit, it still seems a bit sweet), used currants instead of raisins, and added Pisa liqueur, which is a nutty liqueur similar to Amaretto. If your plums are large, quarter them. If they are small, keep them halved. 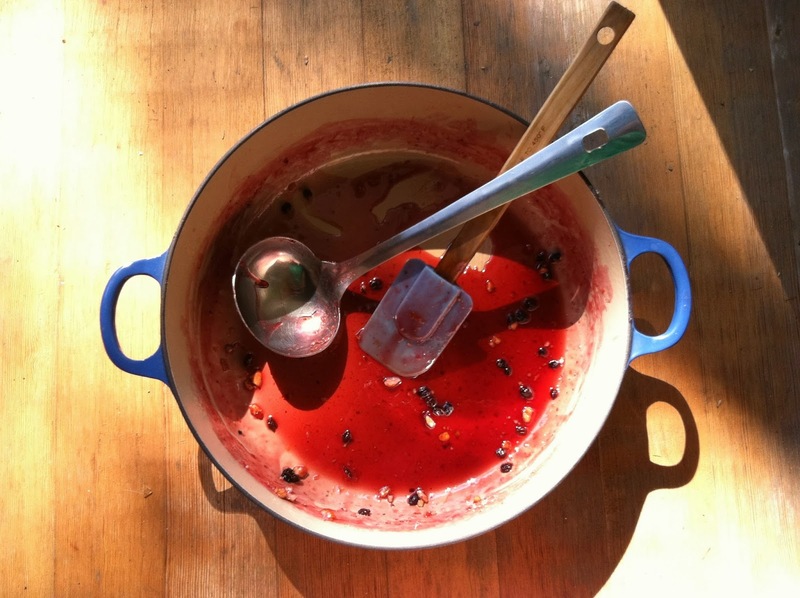 Put plums, sugar, currants, juices and peel in your jam pot and bring them to a boil. While this is cooking, soak the nuts in the liqueur. Let the plum mixture boil for about twenty minutes; they should foam up a bit, and then get glossy and thick. Add the nuts and liqueur, bring back to a boil, and cook for another ten minutes making sure not to scorch the bottom. Process for ten minutes. One thing I love so much about your blog, Jules, is the world that it opens to me, which is so different from our California fall, where the air is so thin and bright, the hills brittle gold, and we wait for rain to put the fire danger down. Blue plums in moody light are a good counterweight. Thank you. Aw, man, I wrote a response yesterday, and it never took! I said: Thank you for reading, Shae! I recall those hills of gold. I hope you get some rain soon! That photo of the blue plums makes me so happy, especially because it's slightly out of focus. It looks like a painting to me. I think I like it because it isn't normally too sweet (no icing crumble or extra sugar). They picture it with waaaaaay less plums than we usually use. I agree with Shae. We've already had two humungous frosts here in Montana and I have a ton of green toms sitting in a bag in my laundry room. It's green tomato season!! Thanks EL! I still haven't made the kuchen and the plums are patiently sitting it out in the fridge. Maybe I will give this one a try instead. What ever will you do with all those green tomatoes? I saw an interesting recipe for green tomato molasses the other day! I've generally been disappointed when I try pickling them or making salsa or so on, so this year I'm adding them as vegetables to dishes where I would normally use things such as green peppers -- Mac and Cheese, soups etc. It's working out well so far and they are delicious used this way. Maybe I'll try roasting them! Hmmm!